For our last lecture in the 2015 series, Dr. Gareth Davies from Trent & Peak Archaeology came to talk about ‘The Archaeology of the Tram’ on the 10th April. For the last three years, local archaeologists Trent & Peak have been providing services for Vinci Construction UK and Taylor Woodrow- Alstom JV, during the construction of Nottingham’s new Tram Network. Gareth told the society how the project has been a rare opportunity to look at two entire transects of a single urban focus, including two of the largest excavations to occur in Nottingham in the last forty years. The two major excavations that Gareth discussed were prehistoric remains at the Clifton and excavations on medieval remains behind the QMC in Lenton. At Clifton, a large excavation on the 12 hectare on the Clifton Terminus Park & Ride facility revealed an important portion of prehistoric landscape with activity from the Mesolithic through to the Middle Iron Age. Important finds include a large early enclosure, pit alignments, the remains of a Bronze Age burial mound and Iron Age settlement activity. 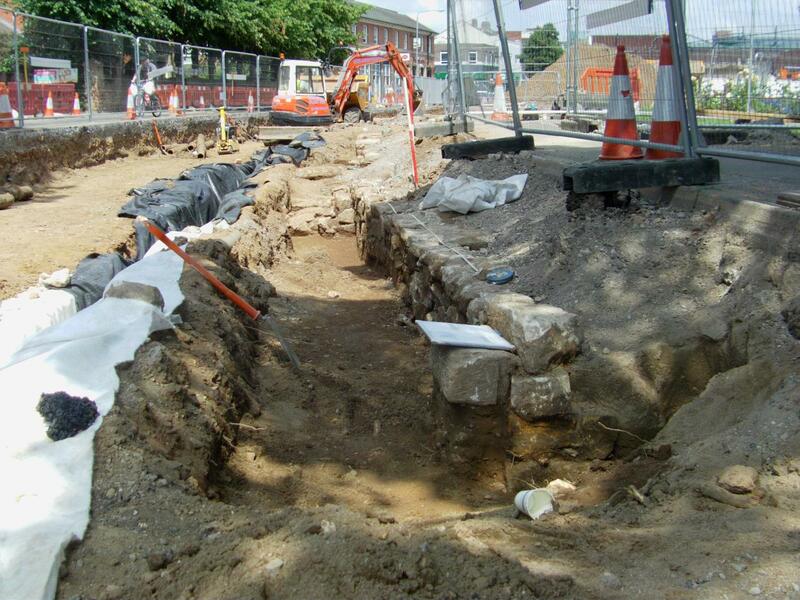 At Lenton, excavation of a deeply stratified site within the grounds of the former Lenton Priory (now demolished) revealed a fascinating sequence of activity dating from the late 11th century through to the 17th century. Important finds included 11th century boundary ditches containing preserved leather artefacts and the 14th to 16th century site of the Lenton priory market or fair rich in artefacts. Re-routing of a cable also allowed TPA to look at the cloister and transept of the priory church which was previously thought to be destroyed. Closer to home, Gareth also discussed some of the findings made during ‘watching briefs’ at Univeristy Boulevard and within Beeston Historic Core itself. This included Bronze Age land surfaces at University Boulevard and Victorian houses, burials, and medieval pits around St. Johns church in Beeston.